The photograph above was taken on Monday 18 May 1914 at the sale in Hampstead of goods belonging to Mrs Louisa Thomson Price and others – all of whom had refused to pay their tax. ‘No Taxation Without Representation’ was the motto of the Tax Resistance League. 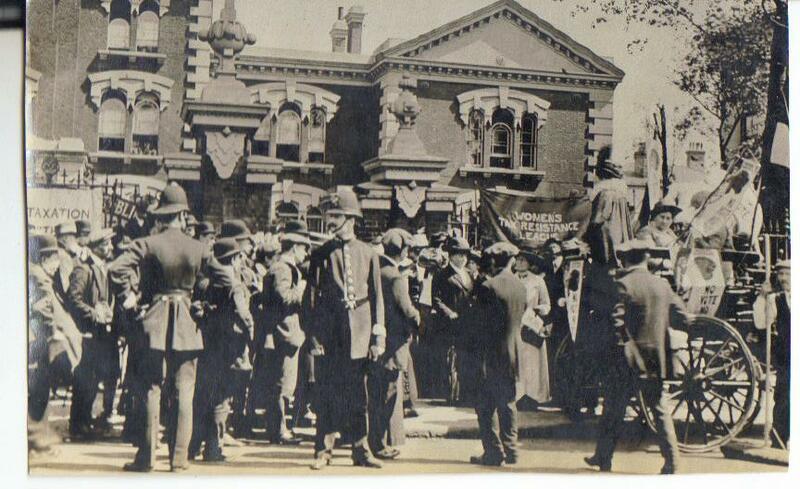 The Vote (the paper of the Women’s Freedom League with which Mrs Thomson Price was closely associated) reported (22 May 1914) ‘At Hampstead on May 18 a large group of tax resisters had their goods sold at Fitzjohns Estate Auction Rooms. They were Mrs Thomson Price, Mrs and Miss Hicks, Mrs How Martyn , Mrs Milligan, Mrs Hartley, the Misses Collier, and the Misses Dawes Thompson. A procession with a band marched from Finchley Road station to the auction rooms at Swiss Cottage and after the sale an excellent meeting was held at the corner of the Avenue Road. From a gaily decorated wagonette speeches were made by Mrs Thomson Price, Mrs Nevinson and Mrs Kineton Parkes, explaining the reason of the protest. Below is the note made by Louisa Thomson Price on the reverse of the photographic postcard. Mrs Louisa Thomson Price was born Louisa Catherine Sowdon in 1864 and died in 1926. She was the daughter of a Tory military family but from an early age rebelled against their way of thinking and became a secularist and a Radical. She was impressed by Charles Bradlaugh of the National Secular Society. In 1888 she married John Samson, who was a member of the executive of the NSS. She worked as a journalist from c 1886 – as a political writer, then a very unusual area for women, and drew cartoons for a radical journal, ‘Political World’. She was a member of the Council of the Society of Women Journalists. After the death of her first husband, in 1907 she married George Thomson Price. She had no children from either marriage. Louisa Thomson Price was an early member of the Women’s Freedom League, became a consultant editor of its paper, The Vote, and was a director of Minerva Publishing, publisher of the paper. She contributed a series of cartoons to The Vote, which were then produced as postcards. The ‘Jack Horner’ cartoon was also issued as a poster for, I think, the January 1910 General Election. Louisa Thomson Price took part in the WFL picket of the House of Commons and was very much in favour of this type of militancy. In her will she left £250 to the WFL. and £1000 to endow a Louisa Thomson Price bed at the Elizabeth Garrett Anderson Hospital. I have a very rare suffrage artefact – a Women’s Freedom League postcard album once owned by Mrs Thomson Price -for sale in my catalogue 185. This entry was posted on July 8, 2013, 8:52 am and is filed under Collecting Suffrage, Suffrage Stories. You can follow any responses to this entry through RSS 2.0. You can leave a response, or trackback from your own site. Interesting about such early tax resistance – I knew of women in the USA who during the Vietnam war had used tax resistance. During the Vietnam war, I think the refusal to pay tax was more accurately withholding tax to be transferred to military purposes, and donating that amount to some other fund. Nonetheless the Inland Revenue Service repossessed their houses, Perhaps that movement was inspired by the pre-WW1 women’s movement! Perhaps too it was more targetted resistance than mere withholding. Louisa Catherine Sowdon was my 2nd great aunt, daughter of William Henry Sowdon and Matilda Louisa Hutton. Louisa Thomson Price has an entry – which contains a good deal of information about her life – in my forthcoming book ‘Art and Suffrage: a biographical dictionary of suffrage artists’ . Elizabeth, I would very much appreciate any information you have on my maternal 2nd great aunt. Any photos of her would be appreciated as I am compiling my family history. Paul ~ I’m afraid that I don’t have any photos of Louisa Thomson-Price. All the information that I have compiled about her will be available in my forthcoming book, ‘Art and Suffrage: a biographical dictionary of suffrage artists’. I’ll let you know when it is published.